In this Event players enter a dream once per day where they get to kill monsters in exchange for rewards such as gold, EXP, titles etc. 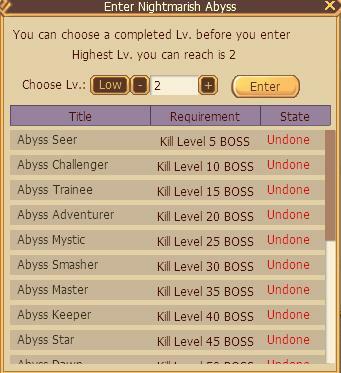 As players keep killing monsters they will be able to go deeper inside the Abyss and fight stronger monsters. If players die they will be teleported out and will need to wait another day to carry on with this Event from where they left off when they died.